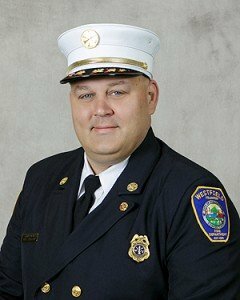 On behalf of the Westfield Fire Department, allow me to welcome you to our website. Our personnel are comprised of approximately 75 dedicated and highly trained men and women that respond to fire, rescue, and medical emergencies 24 hours a day, seven days a week. Our members have gone through various training classes and are certified to handle the dynamic situations when they are called upon. It is the vision of the Westfield Fire Department to be a premier provider of fire prevention, fire protection, medical, and rescue services; and to be held in the highest regard by the people we work with and the people we serve. As a combination fire department, with both paid and volunteer staff, we are always looking for new members to join our team and staff our ranks. I highly encourage you to stop by on a Tuesday evening and find out how you can help. We provide training, free of charge, if you do not have any experience. If you have been a firefighter or EMS provider prior in the past, please come down and share your time and knowledge with us. As you look through our website, please let us know if there is anything you would like to see. This site was designed to be an information center for our residents and business owners to rely on with regards to our services, as well as a connection point to other local, state, federal safety agencies and organizations. Crews were dispatched to a car vs house just before noon. The operator of the vehicle was transported to Middlesex Hospital with non life threatening injuries.